Feel a little guilty about being a bit sarcastic the past couple of days regarding UConn's exhibition matchup with a team that went 4-21 in Division 3 last season. Sure, it's the mother of all mismatches, but Monday's bout with Concordia of Chicago was for a good cause, as Cougars coach Tyler Jones, an East Hartford product who once coached Kevin Ollie with the Connecticut Pride of the CBA, was able to promote his cause of cancer awareness. "It's an honor and pleasure to come back to Hartford," Jones said after his team was predictably trounced, 98-38. "My relationship with (Ollie) is why this all happened. I want to thank UConn for allowing it. The game is great, and the reason to play it is even greater. What a terrific forum to do it and allow me to come home." As for the game itself, here's about all you need to know: walk-on Pat Lenahan (seven points) outscored Ryan Boatright (four). In truth, there were some positive signs. 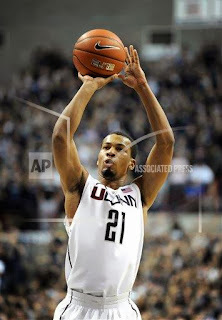 Omar Calhoun knocked down four 3-pointers and finished with a game-high 16 points and seven rebounds. A recent visit from his dad helped Calhoun's confidence in coming back from his two hip surgeries last spring. Terrence Samuel had a double-double (10 points, 12 assists) and earned Ollie's praise. “Terrence played incredible. He’s been doing that the whole preseason. He’s always playing hard. I can get on him, he just keeps playing. He’s revealing a side of himself each and every day ... A double-double really shows his vision, really shows his patience." I keep being impressed with Lasan Kromah, too, who hit a trio of 3-pointers and finished with nine points. “Help the team out in any way possible -- score the ball, rebound, defense. Anything the team needs," Kromah said of his role this season. It's worth noting that UConn won the rebounding battle 49-26, though Concordia had just one player taller than 6-foot-4. Of course, the Huskies were outrebounded by Southern Connecticut last week, though Ollie said that was somewhat misleading. Now, the Huskies get ready for their season-opener Friday night in Brooklyn against a good Maryland team. "I'm itchin'," said Ollie. "We're ready to go." But before a nice reunion on Monday night with his old coach, who could have cut him back in '99 but didn't, helping to pave the way not only to a CBA title that year but for Ollie's ensuing 13-year NBA career.